In the all out quest to have one of the best Pokémon, many people have turned to breeding. There are many advantages to breeding that you can't obtain with the normal catch-in-wild routine. Some of them are getting moves that you can't normally obtain on a Pokémon, getting somewhat better Individual Values for your Pokémon (stats), and just a less harder impact on your wallet in the game since you're saving pokeballs. If you want to obtain some interesting movesets or would like to have some better stats for your Pokémon, then breeding is for you. Thirteen in all. The No Egg group at the bottom includes all genderless Pokémon, baby forms of certain Pokémon, and Latias and Latios. As the name says, you can't breed them unless you have a lovely Pokémon called Ditto, but even then you can only breed some of the non-legendary genderless Pokémon for eggs of that Pokémon. Anyway, if you're having trouble finding a Pokémon's egg group, try to compare the physical appearance of that Pokémon to another. Absol is a Pokémon that has four legs and paws to go with them, so a Pokémon in its breeding group should have a similar appearance, like Manectric. Wobbuffet is a Pokémon that relates to no animal or plant, so Koffing can be a mating partner with it. Chance of getting an egg; 70% | Statement; "The two seem to get along very well!" Chance of getting an egg; 50% | Statement; "The two seem to get along"
Chance of getting an egg; 20% | Statement; "The two don't seem to like each other"
Chance of getting an egg; 0% | Statement; "The two prefer to play with other Pokémon more than with each other." After every 256 steps, the chance is taken and if the random value is selected to allow for an egg, the egg shall be created for you to pick up at the Day Care centre. If no egg is produced, then you need to go back and partake in another 256 steps. A common question is what will hatch from the egg? The egg will contain the lowest form of the female Pokémon's evolution change, barring any pre-evolutions added after the Pokémon was first created. There are several exceptions to this however. The Pokémon Nidoran ♂ & Volbeat are always male while Nidoran ♀ & Illumise are always female. Despite this and them being different species, the egg that the Nidoran ♀ and Illumise hatch will have a 50% chance of being Nidoran ♂ and Volbeat respectively and a 50% chance of being the same as the mother. In addition to this, some genderless Pokémon can also breed. While they're included in various egg groups, they can only breed with Ditto and so the Pokémon will be the base evolution of the genderless Pokémon. 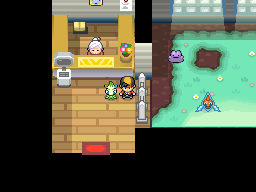 So after you get the egg after the daycare man, you're probably wondering when it will hatch. No, leaving your Gameboy Advance/DS on for 3 hours will not hatch the egg. Like training a Pokémon, it takes effort to hatch the egg. You need to walk a certain amount of steps in order to hatch the egg, depending on the Pokémon you're trying to hatch. It could take from 1,000 to roughly 10,000 steps to hatch the egg, depending on the type of Pokémon. Daunted? Use the Bike and go back and forth withing some routes routes to the east and west. Eggs hatch quickly wherever you use the Bike really. Each egg has a cycle of 255 steps of which you need to complete in order to hatch the egg with the cycle being dependant upon the Pokémon species within the egg. This process can be sped up by having a Pokémon with the Flame Body or Magma Armor abilities which make counts each cycle as two cycles in order to make it progress faster. Now, when your egg hatches, you may notice a few things about it. For example, it is at level 1 (Level 5 in Generation II & III) and the stats are according to that. One interesting thing you may see is that the Pokémon knows more moves than it should at level 5. For example, I bred my female Gardevoir and male Wobbuffet together and when I hatched the Ralts egg, it knew Growl, Safeguard, and Destiny Bond. But wait! It's not supposed to learn Destiny Bond, and Safeguard comes as a TM! Why does this Ralts have both of those moves already? As of Pokémon X & Y, it's now also possible for the mother to pass Egg Moves down. 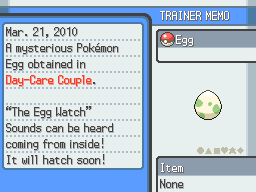 If the mother has one of the Egg Moves of the baby, it will pass the move down. Breeding is a very useful technique when you want to aquire your movesets because of the fact that you can breed over two different sets of moves: Technical Machine aquired moves, and “Egg Moves”. You can however chain-breed it to any Pokémon you would like. Chain breeding? Some Pokémon can only get a move through breeding only if you first breed two other Pokémon for a male version and breed it again to the Pokémon you wish for a certain move to be on. For example, say I wanted to breed Rock Slide to a Cradily. First, I would need to get a Male Relicanth and Female Corsola, breed for a Male Corsola with Rock Slide and breed that with a Female Cradily/Lileep for a Lileep with Rock Slide. For the games from Pokémon Emerald onwards, you have the ability to pass Natures on through breeding. This is done by attaching the Everstone to either of the Pokémon or the Ditto. Once attached, there is a 50% chance of the baby Pokémon having the nature of the female. This changed to being for either Pokémon in HeartGold & SoulSilver and changed to a 100% likelihood of passing down in Black 2 & White 2. In Diamond & Pearl onwards, if you breed two Pokémon from different language games, the chances of them being Shiny is reduced to 1 in 2,048, reduced to 1,366 in Black & White and 1 in 682 from Pokémon X & Y onwards. HeartGold & SoulSilver add another means to transfer specific IVs over from parent to child.The manner of doing this is in having either parent hold a specific item. These Items are the "Power" Items introduced in Diamond & Pearl which boosted Effort Values earned when held. Attach these Items to either of the parents and their specific Individual Value will be passed on to the baby. Consult the table below to see which item causes the baby to inherit which stat. This allows you to send one Individual Values to your baby Pokémon, leaving the rest determined the same way as in the past with some random and some selected randomly from the parents. If you do it to both parents, you'll get a chance of one stat or the other, not both. To aid in this further, within Pokémon X & Y, if you make one of the two Pokémon hold the Destiny Knot item, then the Pokémon will inherit 5 IVs from the parents, chosen at random. In addition to that, if you breed your Pokémon with a Pokémon from another language game, the chances of the Pokémon being alternate coloured is increased fourfold to 1 in 2,048. Since abilities were introduced in Ruby & Sapphire, when a Pokémon breeds, the baby Pokémon, if it is capable of having two abilities, has a 50% chance of getting either of the abilities. Black 2 & White 2 has changed this. Now, the ability the Pokémon will hatch with is dependant upon the mother. If the mother has their ability in slot 1, then the baby has an 80% chance of hatching with that ability, and 20% for the second ability and viceversa if the mother has the ability in the second slot. This calculation even happens if the baby Pokémon or the moth only has one ability, since the ability is the same in both slots. For example, if you are breeding a female Pidgeot and it has the ability of Tangled Feet, the baby Pidgey will have an 80% chance of having the ability Tangled Feet and a 20% chance of having Keen Eye. One of the new features in Black & White is the introduction of a new slot of abilities that almost each and every Pokémon have. Many of these are given over the Dream World on the Global Link, but there are a couple of Pokémon within the games who will automatically have the abilities. Normally, you would be unable to get these abilities through usual breeding. However, if the female Pokémon has the Hidden ability, there is a high chance that the ability of the offspring will be the ability it has listed for Hidden abilities. However, if the male Pokémon has the Hidden ability and the female doesn't, and if you breed the female with a Ditto, the Pokémon will definitely not get the Hidden ability. This is a 60% chance, with the other two ability slots having a 20% chance each. As of Pokémon X & Y, there is the possibility of passing these Hidden Abilities without the use of a female Pokémon. If you have a male Pokémon with its Hidden Ability, and breed it with a Ditto, the Pokémon has a chance of having its Hidden Ability. Before Pokémon X & Y were released, all Baby Pokémon would come in a standard PokéBall. Pokémon X & Y changes this. Providing you are not breeding with a Ditto, the baby Pokémon will now come in the same PokéBall as the mother. This allows for the transfer of balls that were intended to match the Pokémon in the eyes of the trainer, and to not tip off the opponents that the Pokémon has any Egg Moves. As of Pokémon Sun & Moon, male Pokémon and genderless Pokémon can now pass their Poké Ball when they are breeding with a Ditto and there's a 50% chance of the baby inheriting either parent's ball when both parents are of the same species. All Balls except Cherish Balls and Master Balls will pass down. Alternate forms are another feature that pass while breeding. With Pokémon such as Shellos, Minior Core, Sawsbuck and so forth, as Pokémon that have alternate forms but can't ever change form, then the form of the baby Pokémon will match that of the mother, or father if breeding with a Ditto. This means to get Pokémon like Sawsbuck in their different forms, you'll need to transfer those older forms from previous games. Regional variants are a bit different with this. If you transfer original variants of the Pokémon and breed them in Sun & Moon, the offspring will always be their Alola Form. There is a way around this. If you give the mother, or father if breeding with a Ditto, an Everstone, then when the Pokémon hatches, it will match the original form of that parent.